Yesterday, we got much needed rain, but today the weather has cleared. 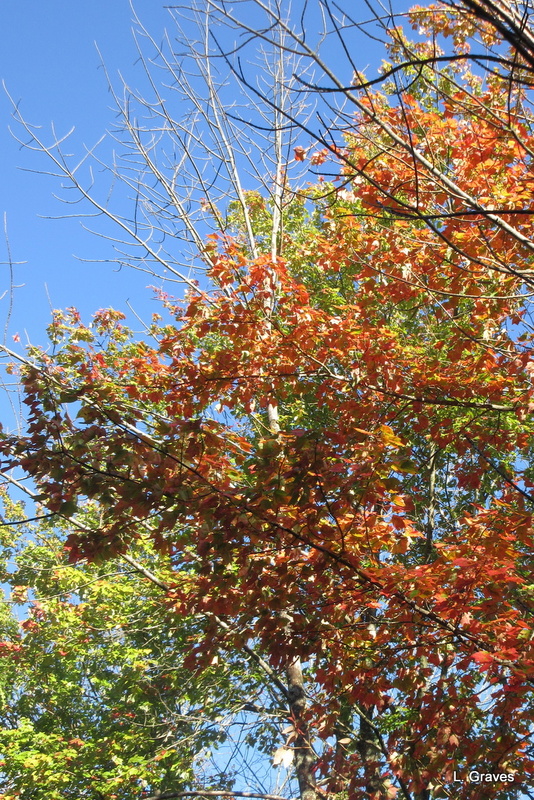 The day is warm—ridiculously so for Maine in October—and the sky is blue. A perfect day for a bike ride, except that my leg is just not up to it. My right leg, which hit the bar of my bike as I fell, still has a bruise with the circumference of a small grapefruit. (Fortunately it doesn’t have the mass, only the width. ) I hobble. I rest. I hobble some more. I rest some more. I am grateful that I didn’t break anything, but I feel a bit glum about not being able to go on bike rides, and I suspect I won’t be able to go on any until next spring. As soon as my leg stops hurting so much, I’ll be riding the exercise bike, that road to nowhere. Despite my sore leg, I was able to take some pictures this morning, of the sun streaming into the woods and onto the trees. The changing leaves have not been brilliant this year—too warm, too dry?—but still they are lovely. 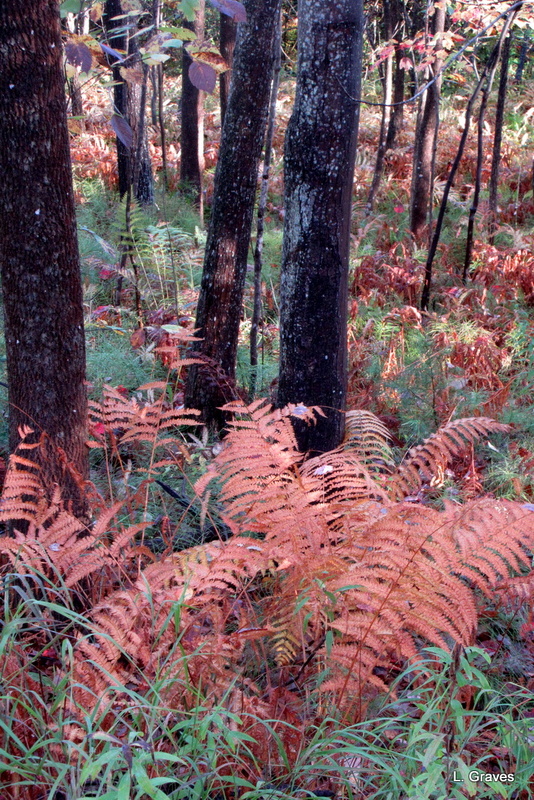 As the ferns change from green to tan, they light up the woods. Tomorrow, weather permitting, I hope to get into town, with the car, of course, and take some pictures of trees by the lake. Spring and fall are such glorious seasons in Maine. Spring has the flush of youth, and it bursts upon us in a rush, with a froth of blossoms and an oh-so tender green. Spring never stays as long as we would like as she runs headlong into summer. Fall, on the other hand, comes in an aching blaze, and on nice days, there is such a glory of bright leaves and blue sky that you can almost forgive fall for binging the shorter days that eventually lead to cold winter. Almost. In the fall, our thoughts turn to soup, and I have two of Farmer Kev’s butternut squashes that are begging to be made into soup. I also have some of his onions and garlic. My little garden has a frenzy of herbs, with the oregano being completely out of control. Clif will help me chop the vegetables and herbs, and who knows? If my leg isn’t too sore, maybe I’ll even make a batch of biscuits to go with the soup. My biscuit recipe comes from my mother, who surely made the best biscuits in Maine, if not New England. Anyway, these are all things to perk me up. I still wish I could go on a bike ride, but these fine October days, with their beauty, along with the plan for soup and biscuits, chase my glum thoughts away. Sorry to hear about the leg (I’m catching up and working my way backwards). Meanwhile, the autumn colours look good, even from a car. Photos are beautiful,Laurie. Good luck with the leg. I second the recommendation for Arnica. Great stuff. Many thanks! I’ve bought a tube of gel made with arnica. It seems to help a little. Colors subdued here as well, except for the occasional red maple and sumac. Your photos are pretty, love that sienna-colored fern. Hope your leg heals quickly! I too have tried arnica with some good results and some less good. Rest and elevation is what Mrs Tootlepedal says to me on these occasions. She is right, but how I hate do those things when so much needs to be done around the house. Aw, Laurie – don’t get discouraged. We people who strive are often met with setbacks. That’s because we push our limits. And sometimes we suffer. But we need to keep pushing because that is why we are awesome. Aww, thanks, Jodie! Your words of encouragement made me smile. I have never seen ferns as beautiful as that. So sorry you can’t bike to enjoy the colors. You worked hard to get to that point. I appreciate your gift for putting a positive spin on adversity. Thanks, Beth. Yes, being grounded is a bummer, and even more so because it was my own darned fault that I fell. I wasn’t paying attention and ran right into Clif when he was slowing down because of a traffic tangle on Memorial Drive. So frustrating. But, the leg will heal, and at least I didn’t break it. Plus, it’s hard to be down in the dumps in glorious fall. I hope you leg mends soon – so frustrating not to be able to take advantage of the weather. I love your mention of ‘biscuits’ – something that completely confused us when we first visited New England and were offered them with fried chicken. Here in the UK we would call them scones. Would you share your recipe? Thanks, Jan. Very frustrating. Biscuits are something like scones, but they are never sweet, and are made to go with a main meal. I will indeed share my recipe. Stay tuned! Thanks, Derrick. The ferns in the woods are lovely this time of year. It must be so frustrating not to be able to enjoy this weather the way you’d like! But don’t push your luck and try to ride too soon, either. I need to get out, as you have, and enjoy the colors–they aren’t as vibrant here either and I haven’t taken the time. I like the photo of the ferns and the reminder that it’s not just maple leaves that give us great color! You bet it is. Plus, there are many fall chores to do. Oh, well. As I keep telling myself, at least I didn’t break anything. 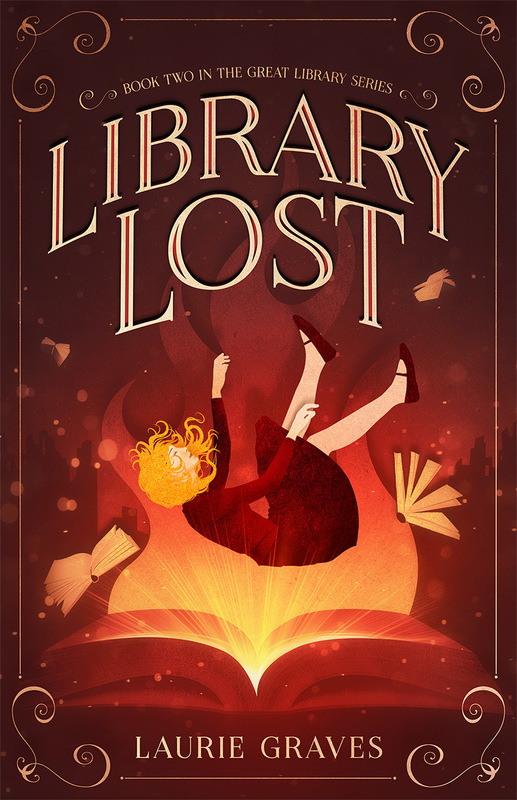 You can always sit outside and read, soaking up the sun in this summer-like spell. Rest up your leg so that it doesn’t continue to give you trouble! I hope it heals soon. How frustrating for you! I do hope it heals quickly but it does sound as if you’ve bruised yourself badly. What lovely photographs you’ve taken! I love those ferns and the leaves against the blue sky are gorgeous! Thanks, Clare. Very bruised and healing oh so slowly. Very frustrating. But at least it isn’t broken. “A frenzy of herbs” – I like that. Sort of like a pride of lions. That photo with the ferns is beautiful! I hope your leg is feeling better – all the best! It is feeling much better. Thanks, Sheryl.